I woke up this morning to the news that I’ve managed another couple of placings in this year’s WPJA “Photographer of the Year” 2013 competition. 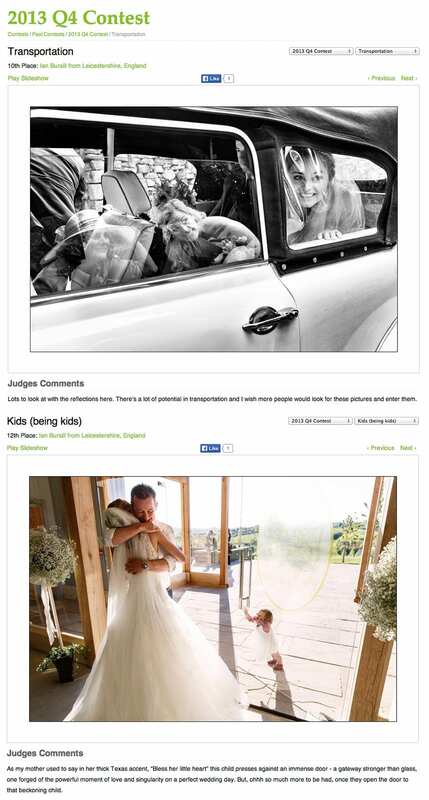 It’s Q4, the final quarter of the yearly competition and the contest showcases the wedding photojournalism of WPJA members from the final quarter of the 2013 year in 17 categories, with about 23,000 entries in this contest. With that many entries, I’m chuffed to have got two placings! Thanks to Laura & Teddy & Nadine & Rob whose weddings provided me with these images. Competition Time – Win a FREE location shoot! New member of the ISPWP Image of the Year 2013 Result & Winners!